I ran into an interesting situation today not unlike one I’ve encountered hundreds of times before but this time with Google Chrome. One person was able to reproduce the bug on an internal tool with ease. Nobody else was able to. Eventually upon getting the version number it clicked. This particular computer had Chrome 10 installed. For my younger readers, Chrome 10 is an “ancient” version from March 2011. This is back when Obama was still in office, the United States was in a recession, there was a debt problem in Europe, hipsters carried their iPads in man purses… These were crazy times. For whatever reason this Chrome install, like a number out there didn’t update. It could be security permissions, it could have been disabled for some reason. I really don’t know, or care terribly much. The reality is not everyone can update on release day regardless of opinions on the matter. Go try and find Chrome 10 Mac OS X on the internet. Try using a search engine like Google. Now try and find it for any platform. Good luck. It’s a pain. I can get a Phoenix 0.1 binary from Sept 2002 (this was my primary browser for part of fall 2002, I used it before Firefox was cool), but I couldn’t find Chrome 10 from way back in 2011. I was eventually able to trace down a Chrome 10 binary, work around the problem and move forward however it took way more time than it should have. Version numbers still matter – They matter. Simple enough. Even in a rather sterile environment that this was, I had to deal with an older browser. They exist in larger quantities out in the wild web. Saying they don’t matter anymore is naive. Idealistic, but naive. Make old platforms available – Just because you ship a new version doesn’t mean the old one has no relevance or need anymore. Google lost some serious credit in my mind for making it nearly impossible to get an “older” version of Chrome to test with. This shouldn’t be difficult. Google is said to have approximately 900,000 servers. Surely they can setup an archive with an explicit notice it’s an archive and user should download the latest. Mozilla’s got less than that. The web is a fluid platform. Browsers are evolving platforms. Versions still matter as long as two things, the web at large, and the platform that is the browser need to interact. When version numbers no longer exist, it will likely be because monoculture is so strong it doesn’t matter. Until then, knowing what browser and what version will matter. Browsers will likely never agree 100% on what to implement and a timetable for implementation. That image is a joke if you can’t tell. Google Chrome Developers are good people, they just need to put together an archive page for web developers. I (probably somewhat predictably) totally agree with you. Though, to be fair, I think the title of the blog is misleading; your (totally valid) complaint is that “this new wave of ‘infinite version‘-insanity makes it difficult to do debugging and trace back bugs or support users that are in these situation. There’s a 1984-esque quality to the practice, as if Google is interested in erasing its own history. They don’t want you to remember there was a version of Chrome that shipped with a particular bug; an apt analogy might be an “auto-updating” newspaper that doesn’t contain a date, and which libraries don’t keep any copies of. I don’t know why companies are so interested in playing it that way these days; it would be interesting from a program manager or executive standpoint why they think it’s even worth taking the effort to hide it. @Preed: As long as my “customers” (internal work users, external visitors, or even/especially personal blog readers) notice, I care. Hmm, are Chromium versions tagged in their SVN repository? I wonder if you could do a build from source instead (or if that’s what they want you to do). @Daniel Glazman: Valid point. Though I don’t think there’s a true “HTML5” either. 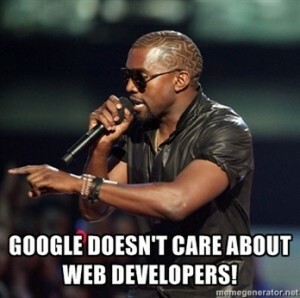 In my world, unless 90% (generally closer to 100%) of the web can use it, it’s not in my toolbag. That’s just a reality of needing to be compatible with a large audience. Until browser vendors can agree on an order to implement things, due dates, and a way to deprecate their older install base, there is no explicit version. Not that I’m advocating that. It is indeed “rolling”, but nowhere near as advanced or fast as WHATWG thinks. In my mind we’re still in a HTML4/XHTML world with some HTML5 mixed in for the foreseeable future. This might be another blog post. In the same vein, beta version numbers matters too. I’ve had suspecions that my firefox beta didn’t update properly and it was a pain in the *** to figure out if it was updated because all I had to by was “Beta”. It was nearly impossible to see online what the newest beta version was and it was only slightly less difficult to see what my own beta version was. How do mozilla develop internally? How can you guys talk about updates in firefox when there is no nomenclature to differentiate the updates?